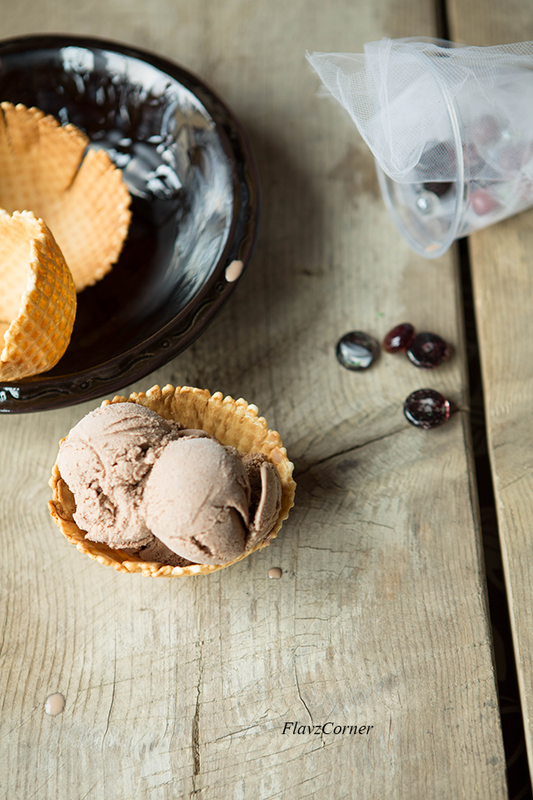 Once you own an ice cream maker, you are constantly in the hunt for new recipes and you will experiment with all the possibilities that could whip up. I have to warn you that its pretty addictive. At least that is true in my case. I love making ice cream for my kids rather than buying them. My kids are at the point where they say No to the store bought tub ice cream. People who know me always inquires, 'But it seems suspicious that you make these and don't gain any weight?'. Well, the truth is that I don't have a big appetite for sweet treats, I enjoy them moderately. The guilt of indulging too much sugar and the fear of increase in waist line always haunts me, so as soon as the inner conscience starts to bicker, I evade from the sweets :) That doesn't stop me from making them and enjoying them moderately. Baking and preparing desserts are therapeutic to me. 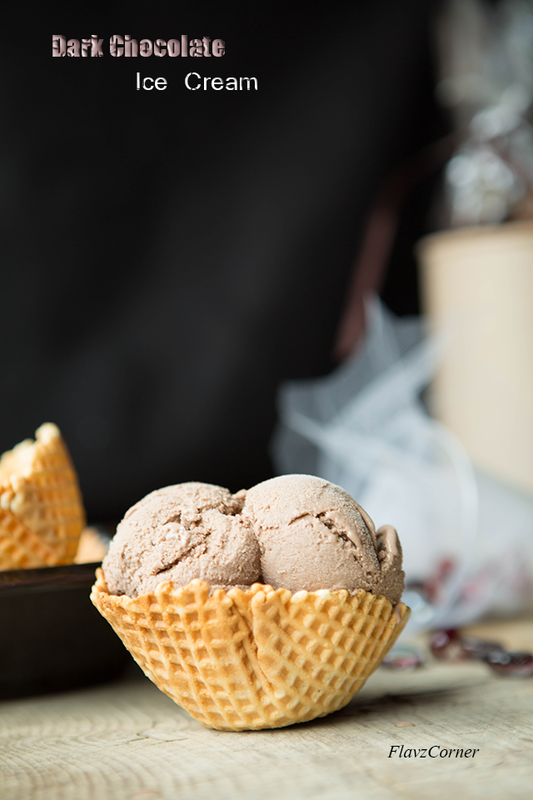 Here is the recipe of Creamy Dark Chocolate Ice Cream I made couple of weeks ago. I also made some Popsicle with layering vanilla (before adding chocolate) and chocolate ice cream out of this recipe. But I never got the chance to take pictures as they were dissipated into thin air when I decided to serve them to the group of kids in my family who were exhausted after a fun filled volley ball match in our backyard. In a heavy bottom sauce pan, mix half & half, sugar and salt and bring to simmer. Take 1 cup of the warm half & half mixture and pour into the egg yolk mixture by whisking continuously. The egg mixture is warm enough now. Pour the egg mixture back into the sauce pan. Cook the mixture for 15 - 20 minutes by stirring continuously on medium heat till the mixture reaches custard consistency and coats on the back of the spoon. Turn off the burner. Take the bowl with 1 cup of chocolate chips/chunks. Pour the hot custard through a fine mesh sieve (to remove any coagulated egg) into the bowl with chocolate chips. Use a spoon to stir continuously so that the chocolate melts and mixes well. Cover the custard and refrigerate over night. Make the ice cream according to the ice cream maker's instructions. If you don't have ice cream maker, pour them into Popsicle molds and freeze. 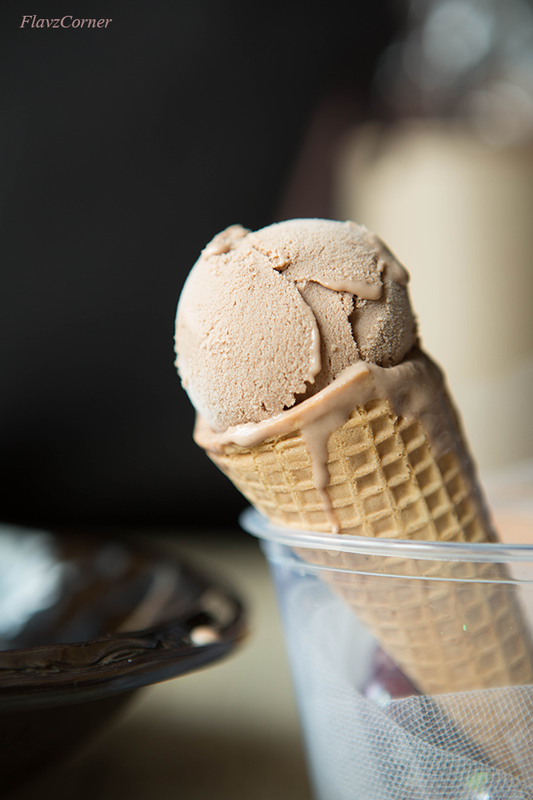 Either way you can enjoy this silky smooth and luscious treat on a sunny day! Creamy and chocolatey...a wonderful summer treat, Shibi. I should use my ice maker more often! Creamy. Dark Chocolate. Ice cream. All these things when put together are even better!! The ice cream sounds yummy. I love homemade ice cream! And anything with chocolate gets my vote. This is so nice -- thanks. Icecream looks creamy and yum.....love the small cones, look cute. that absolutely looks like a treat!!!! This is so lovely. I do not have an ice cream maker but really thinking of getting one. Thanks for the recipe. Love everything about the ice cream texture,color and of course the pic clarity. Thanks you everyone for the lovely comments!! This one looks perfect and the pics are lovely! Oh My! What I would give to have that ice cream right now! Dark chocolate is my eternal weakness and I never find ice creams without excess sugar that completely steals the depth of dark chocolate. Your recipe and photographs are sooooo good! Half & Half is equal parts of milk and cream.